Also serving communities of Madbury, Durham, Lee, Portsmouth, Hampton. There are 16 Assisted Living Facilities in the Dover area, with 4 in Dover and 12 nearby. To help you with your search, browse the 72 reviews below for assisted living facilities in Dover. On average, consumers rate assisted living in Dover 4.3 out of 5 stars. Better rated regions include Rochester with an average rating of 4.8 out of 5 stars. A historic city and family-friendly community in New Hampshire’s Seacoast region, Dover offers seniors peaceful living and enjoyment of nature, culture and various forms of recreation. Seniors can choose from four assisted living residences (ALRs) in the Garrison City and 16 in surrounding areas. The two types of ALRs in Dover and the rest of the state are residential care facilities (RCFs) and supported residential care facilities which accommodate nursing home-eligible clients. Both categories are regulated by the Health Facilities Administration of New Hampshire’s Department of Health and Human Services. Winters in Dover have an average low of 14 degrees Fahrenheit in January. This may be uncomfortable for some seniors, but the cold season offers plenty of activities to enjoy including ice skating at a discounted price for residents 62+. The Dover Community Senior Center facilitates indoor pickleball, travel and other fall and winter activities. There are no income, sales, social security and pension taxes in New Hampshire. Retirees enjoy significant savings despite Dover's relative high cost of living. Mobility in Dover is viable for seniors. Residents 65+ pay only half the fare for C&J buses to Boston, most Amtrak Downeaster intercity train rides, the University of New Hampshire’s Wildcat Transit buses and COAST buses going around Dover and surrounding areas in New Hampshire and Maine. The Community Action Partnership of Strafford County offers scheduled senior transportation to shopping destinations in Dover, and New Hampshire’s Medicaid transportation program assists beneficiaries in arranging rides or reimbursement of travel or gasoline expenses to accredited health service providers. The Garrison City's colorful history gives seniors interesting arts and culture activities. Downtown museums and historic landmarks are well-preserved, and the seven-week Cochecho Arts Festival every summer presents an eclectic variety of concert performers, theater shows, art demonstrations and Farmers’ Market stage performances. The Dover area is home to world-class medical facilities, including Wentworth-Douglass Hospital, Bellamy Health Center and ConvenientMD Urgent Care, in the event of medical emergencies or illness. Dover is a member of the AARP Network of Age-Friendly Communities, meaning that its elected leadership “has made the commitment to actively work toward making their town, city or county a great place for people of all ages,” according to AARP. Assisted Living costs in Dover start around $0 per month on average, while the nationwide average cost of assisted living is $4,000 per month, according to the latest figures from Genworth’s Cost of Care Survey. It’s important to note that assisted living rates in Dover and the surrounding suburbs can vary widely based on factors such as location, the level of care needed, apartment size and the types of amenities offered at each community. 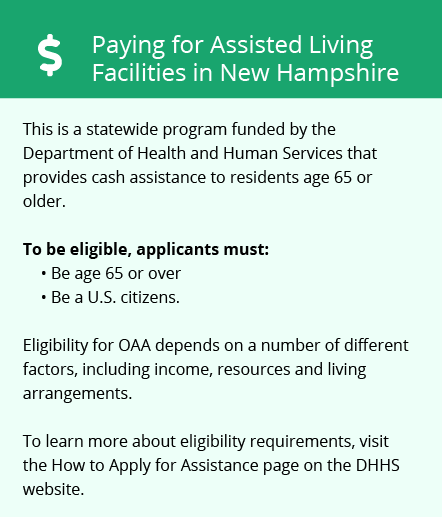 The Bureau of Elderly and Adult Services (BEAS) of New Hampshire's Department of Health and Human Services covers the cost of ALR services for Medicaid-eligible seniors in Dover through the Choices for Independence (CFI) program. Learn more about these programs, plus who’s eligible, on our Assisted Living in New Hampshire page. For more information about different ways to finance assisted living, visit our Assisted Living in New Hampshire page. Dover and the surrounding area are home to numerous government agencies and non-profit organizations offering help for seniors searching for or currently residing in an assisted living community. These organizations can also provide assistance in a number of other eldercare services such as geriatric care management, elder law advice, estate planning, finding home care and health and wellness programs. To see a list of free assisted living resources in Dover, please visit our Assisted Living in New Hampshire page. 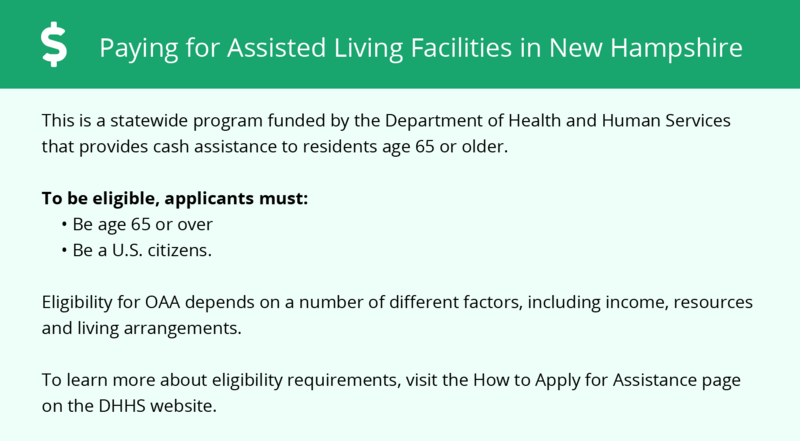 Dover-area assisted living communities must adhere to the comprehensive set of state laws and regulations that all assisted living communities in New Hampshire are required to follow. Visit our Assisted Living in New Hampshire page for more information about these laws.